Not wanting to miss out on yet more fine weather, Nita and I had planned to get out again last Sunday. We’d both been working all day Saturday and so decided to have a day in the Arrochar Alps as they are a relatively short drive from Irvine. Then, however, it dawned on us that it was the August Bank Holiday weekend in the rest of the UK and we reckoned that there would be a lot of walkers heading north for the long weekend to climb a few Munros. The Arrochar hills are very popular at the best of times and so might have been a little too busy for me last weekend! I do like walking in quiet places although whether this is just because I’m so slow and get a little embarrassed when constantly being passed by other walkers, or whether it’s just because I’m an unsociable grumpy (almost) old man …..well, it’s debatable! Thankfully, Nita similarly likes the peace and quiet and so we’re well matched. So then, where to go? 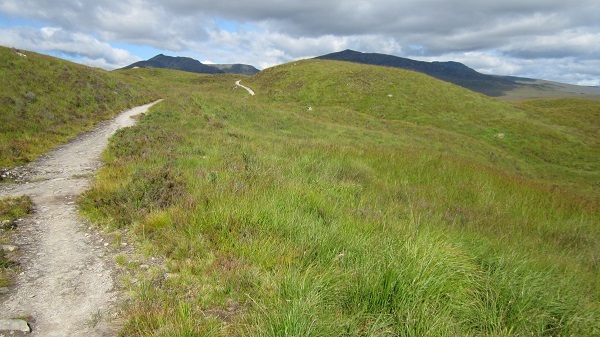 A few years ago on a similarly fine summer weekend, we did the circuit of Meall Tairbh and Ben Inverveigh, the two small but rough hills near Loch Tulla. On that occasion we’d parked in a very busy car park near Victoria Bridge but once on our way, we saw none of the other cars occupants for the rest of the day. This then seemed the perfect choice for Sunday. Although both the hills are only around 650m high they offer pretty rough walking on generally pathless slopes of grass, heather and rock. This circuit over the two hills with the steep descent and re-ascent of just under 150 m makes for a good walk. 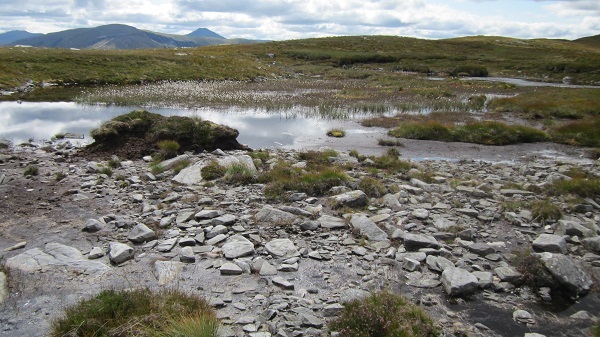 This time however, we decided to park the car at the Bridge of Orchy and walk the few kilometres along the West Highland Way to reach the start of the long broad ridge of Ben Inverveigh. It means a slightly longer day but makes for a pleasant easy start and finish with the added advantage that at the end of the day, you are parked by the Bridge of Orchy Hotel…… perfect for an evening meal before driving home. And well, yes, it all worked according to plan….just! We’d been rather casual and had decided to leave a little later than normal in order to reach the Green Welly in Tyndrum in time for breakfast. Then however, we found the main road out of Ayrshire closed at Beith. We headed across to the old Glasgow road at Lugton only to find that this was closed too!!! The sat-nav put us right but we must have spent a good half hour driving along small country roads before finally bobbing out in Paisley. Still, this was not a problem as we had plenty of time and so after a relaxed if slightly late breakfast at the Green Welly, we drove the few miles to Bridge of Orchy and were walking by about half past ten. It was however, incredibly beautiful with the air being very clear for a summer day. The views were stunning and even I could make out some of the more distant peaks. Of course, of course, we just had to keep stopping to look and take photos and so didn’t reach the summit of Ben Inverveigh until after 13.30. Still, no problem, we had plenty of time! We were still on course when we reached the summit of Meall Tairbh at about 16.45 but it did seem a long way back to the West Highland Way. 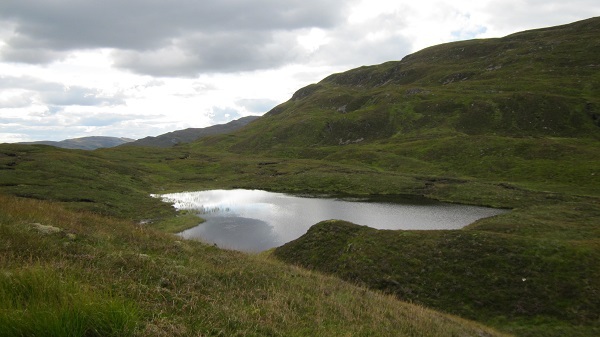 The final few kilometres to reach this famous path were over very rough and boggy ground but in the past we’d picked up a path of sorts. This time however, we decided to head over to the river as Nita reckoned she could see a path along its bank that also led back to the WHW. This in retrospect was not a good idea. The ground was even rougher and wetter and our pace went from slow to almost full stop. Time however did not stop and still short of the WHW by some way, we realised we were starting to get a little late. 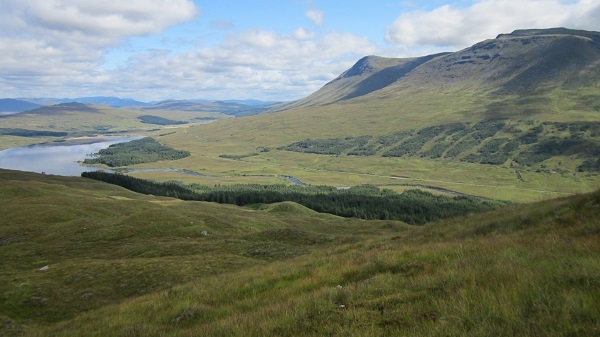 When we did finally reach it, it was just after 19.30 and we still had the walk back to Bridge of Orchy to do in fading light. Nita, who had already done her usual great job of guiding me, had her work cut out as we descended the rough track in what for me was very poor light. Wow, quite a day and we didn’t see anyone from the point where we left the WHW in the morning to the point where we re-joined it in the evening! It’s good to be sociable!